Technology is so fixed onto itself, that coming upon web resources about purely offline and silicon-less topics is kind of refreshing. I’ve picked The Most Useful Rope Knots for the Average Person to Know site from oursignal some time ago and had really enjoyed reading all of it. 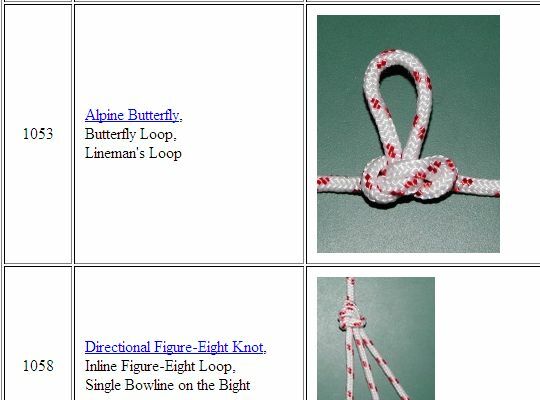 As lengthy title explains site offers selection of knots that are easy to remember and tie. It is really site aimed at anyone, as opposed to hobbyists that enjoy advanced aspects of more than extensive knots topic. Site has bit of theory, but most of it is really list of knots and their variations with instructions and photos. Plus more specific and even purely decorative knots. Site completely lacks design and usability. It is purely informational and could really use some multimedia. It is often difficult to understand complex knots from only few photos and text instructions easily blend into wall of text without paragraphs. I also hoped to find some info on packing and such of objects with rope, but most of content is focused on rope alone. Even with limited and fine-tuned selection there is still way too many knots on site. Suggested usage (that makes a lot of sense) is to skim everything but only to choose knot or two from each category and learn them. So, how do you like a post on… ancient technology for a change? Should I mix such in from time to time? Voice your opinion in comments. thats quite a diversion from technology. Yep, but it IS site with good and useful information, which by definition fits my web category. Don’t worry, I won’t go off the rails suddenly. :) Still I’d like to dip sideways from time to time, it is quite refreshing. Thank you! :) Bookmarked to browse later. This is very interesting stuff, excellent idea of topic. Thanks for the reading. See? :) It might not seen like cutting edge tech… But it is plenty useful when needed.